Confederate Jasmine (Trachelospermum jasminoides) also known as Star Jasmine is not a true jasmine but referred to as one because of the fragrant jasmine-like flowers it produces. It is hardy in zones 8-10 and ubiquitous in the southern states. Cultivar Madison is hardy up to zone 7. The twining foliage emerges with light green lance-shaped leaves and then matures to a glossy, dark green color which produces clusters of white star-shaped flowers in late spring to summer. Once established, this fast growing evergreen vine, which can grow up to 20 feet, can be trained to climb supports such as fences, pergolas, pillar and trees. With tip pinching and trimming, it can also be grown as a spreading shrub or a weed choking groundcover. Its tight growing habit also makes it an ideal candidate for topiaries, trailing containers and hanging baskets. 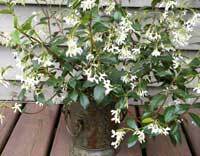 Confederate jasmine prefers fertile well-drained soil with full sun to part shade exposure. Fertilize from early spring to fall with a well balanced (NPK) fertilizer for acid loving plants. Pruning is important to control excessive growth and thicken the foliage. Prune straggly and tangled vine grown indoors in the fall/winter when growth has stopped and/or after blooming to promote lateral branching. Because C. jasmine blooms on last year’s growth, the best time to prune outdoor plants is after blooming (April-May). Prune away dead, weak, cold damaged shoots in late winter after danger of frost is over. Prune back no more than 1/3 of the vine at a time. The semi-hardwood cuttings dipped in rooting hormone can be propagated in the spring/summer to produce additional plants. Cuttings exude a white milky sap which can be a skin irritant. Trachelospermum jasminoides tolerates a minimum temperature of 40 degrees and therefore in colder climates needs to be grown in a container and brought indoors for the winter. As a houseplant, they can adapt to moderate light exposure as well as neglectful watering but grow best in bright indirect light in the summer and need a minimum of 4 hours of direct sunlight in the winter. Night temperatures of 50-55 and 68-72 during the day are preferred. In the winter provide added humidity but water less. Another cultivar, Trachelospermum asiaticum cv mandianum, Asiatic Jasmine is also a popular container plant. It has smaller, oval leaves and sweeter yellowish white flowers with a longer blooming time which can start(depending on temperatures) early to mid-winter to the summer. I bought a confederate jasmine plant from an home improvement store last April, I bought a plastic pot twice the size of the plastic pot it was in and potting soil. I put my jasmine in the bigger pot, watered and placed on my porch. The blooms started falling off about 3 weeks later and none have bloomed since. The leaves are green but dull and the only growth I’ve seen are new seedlings coming up at base in soil. We live in a second story garage apartment in Florida and I’m wondering if its not getting enough full sunlight but during summer the direct sunlight scorches many of my other plants so should I place the container downstairs in full light? Since you repotted your jasmine, it may be in transplant shock, causing the bloom drop. Better to transplant when not in bloom, early spring/late winter. Jasmine bloom better when pot bound. I would move it to a more protected (slightly shaded) area until it recovers. We have a star jasmine plant in a container, purchased this year, and there are very small plants growing from the dirt at the base of it spreading outwards. This may be a dumb question but is that new plants from the roots or a weed? We have never had this type of plant before so I’m not sure. I can take a picture but no place to attach. If the new plant looks similar to your star jasmine, then it is possible that it is a seeding. On the other hand, there is a good chance that it is a weed that sprouted from the soil. I have noticed the same thing with my potted jasmine, it was new growth not weeds. I hope its the same for you. I was given a Confederate Jasmine last year by my daughter and her husband. I planted it near my privacy fence (wooden). It is growing very fast and is now loaded with beautiful white flowers. The problem? No fragrance. Is this a common problem? I don’t see anyone else with this situation and have never seen a jasmine of any kind that did not have that great jasmine smell. Could it be a water issue? Too much rain and cold weather? i am planning to plant Confederate Jasmine in a planter that is 8 inches wide 18″ deep channel along a 12′ section of a planter. I want it to grow around th fencing that is 4 – 5 foot high along the 12 ‘ fence section. My question is : is the channel wide and deep enough to support a healthy rootball system to grow that high and wide? I brought my star jasmine inside for the winter. Now it’s losing all its leaves. How can I save my plant? It’s not uncommon for Confederate Jasmine to loose some of its leaves when they are brought indoors. The amount of light is much less and the plant will compensate for that by dropping its leaves. Move it to the sunniest spot in the house. The need a minimum of 4 hours of direct sun in the winter. Also provide more humidity and keep the plant on the dry side (don’t overwater). You might also check the plant for insect infestation which could be another reason for the leaf drop. Once all the leaves drop it will go dormant and may re leaf in late winter. I repotted my confederate jasmine I just purchased into a bigger container. I live in the foothills of South Carolina. The temperatures here are getting really cold. My concern is will it live in the pot over the winter? Need to know what to do? Help!!! I live in growing zone 4/5 so I keep my potted Confederate Jasmine indoors for the winter. Confederated Jasmine is hardy in the ground in zone 8-10 (lowest temp 10 to 20F) which may be where you are. There is another issue with it being in a pot as there is not enough insulation (soil) to protect the roots from freezing and thawing cycle. Your options are to bury the pot in the ground or wrap it with some insulating material, such as blankets for added protection. Another method is to place the existing pot in a larger pot and stuff straw, soil or mulch between the two pots. This should help maintain even temperatures. In addition, move your plant to a protected area (south wall close to house) or to the garage away from cold winter winds. tried Roundup in the areas along my home foundation to try and provide some space to keep it off my house. The Roundup doesn’t appear to have worked in killing off this Jasmine. Is there another spray that will kill off the jasmine that is close to my house, but leave the rest in good condition? What about trimming the jasmine so it stays off your house. Most herbicides are systemic and will travel to other parts of the plants. Well, the roundup worked just fine. It took several days but the unwanted jasmine has turned brown and died and the rest of the plant is in great shape after a month. So no residual damage from roundup. It just takes a little longer than expected. How large does the root system get to be? How close to a sidewalk or a patio can it be planted? Hi, my potted jasmine got too hot here in Southern Ca.. I cleaned out the yellow leaves but notice the leaves feel sticky and look dirty. Is there a safe way to hand wash the leaves? The sticky substance may be honeydew which is secreted by insects such as scale. The black “dirty” surface is caused by sooty mold a fungus which grows on the honeydew. Sooty mold reduces sunlight to the leaves blocking chlorophyll production. The leaves can be cleaned with a wet paper towel but sooty mold is more difficult to remove. Check the underside of the leaves and stems. If you find bumps on the surface, then you may have scale and need to treat the plant for scale. My con. Jasmine is trailing on iron on front porch . I live in north Alabama and we have had some freezing temps lately. It has looked very green and healthy until this past week . Now leaves are turning brown and some are dry. Do you think it will completely die and what can I do. Hhould it be trimmed ? The two plants are approximately four years old??? Confederate jasmine will drop its leaves when exposed to freezing temperatures but that doesn’t mean that the roots which are in soil and have some insulation have been affected. It all depends on how low the temperatures were and how long. I would wait until early spring to do any trimming, if there is any life in the vine, it should then send out some new leaves. Also, you will be able to see what parts of the vine died and need pruning. Generally, a vine can be trimmed by 1/3 of its size. I was wondering how you Jasmine turned out? I live in Central Alabama and the same thing is happening to me. I have a wall of jasmine and on of the four plants on it is doing the same thing. It’s been well established for several years. I have 4 other vines in my garden that seem absolutely unaffected by the cold. There was some frost damage to other vines on the wall, but this one had dropped virtually all of it’s leaves. I know it been a year since you posted on this site. I hope you get the message if you do please respond to crazyboutflowers@gmail.com thanks. I have a Confederate Jasmine (so the label said) at a Walmart Garden shop. I brought it home and planted in a large container with a trellis, and put it on the patio. I live in St. Augustine. The plant flowered beautifully in the spring and then grew like crazy. I just trimmed the plant (its now October) by 1/3 and brought it inside. It still is growing – sending out vine growth, and appears to be doing well. The problem, all the pictures I have seen of Confederate have dark green leaves. Mine are a variegated mix of green and yellow on each leave. I thought there might be something wrong with the plant, but it seems to be happy growing out new vine shoots, but not a much as it did in the summer. The plant looks healthy, the blooms were white and very fragrant – it this really a Confederate Jasmine? You must have a variegated confederate jasmine, which will have green and cream colored leaves. It can bloom all summer long and I love the fragrant flowers. The vine will grow less and at a slower rate during the winter months and burst into growth in late winter. Your jasmine will get some yellowing leaves due to lower light conditions in the winter which will be normal. Some things to note; water less in winter and keep an eye out for scale. I have a Confederacy Jasmine that I just bought up from the basement after the winter (I live in Chicago). Do I need to prune it? What else should I do? Is it actively growing? If you prune it now, you will loose the flowers. It should be pruned in the fall after bloom. Place it in a bright window. Agreed. Don’t prune it! Put it in a warm, sunny part of your house where it gets lots of light, fertilize now with Miracle Gro and water once a week. It should start blooming in May for about two weeks. Don’t prune until the fall when it’s time to put it back in the basement. i live in rockland county ny, what can i do with my jasmine plant(confederate jasmine) for the winter? i have already lost 2 plants covering them outdoors, not in plastic. You need to bring them indoors for the winter. It tolerates a minimum temperature of 40 degrees. Hi my jasmine also has the small white bumps all over. For the life of me I cannot figure it out. It is doing really well besides that, so I would like to salvage it if possible. Did you ever figure that out? Regarding the white bumps-need more info. Can they be scraped off? Do they look like cottony fluffs? Is there sticky residue on the leaf surface. I live in Las Vegas and am moving next month in March. I was curious to see if you had any tips on transplanting my outdoor jasmine plant that is entwined in a couple large trellises. Should I try to carefully untangle it or move everything together? When you dig it up, make sure you get as many roots as possible. The plant will be in shock and will most likely drop some of its leaves. I would untangle the jasmine plant and cut it back by 1/3 to make it manageable for the move. Good luck with the move. I have read conflicting information that Confederate jasmine is toxic/poisonous. We plan to plant this close to our vegetable garden against a fence to provide privacy to our backyard. Please advise. Help my ( confederate Jasmine) are healthy one day.. The next day yellow/brown spots dropping fast!! I might have been a problem in the works for some time. Hard to say what is going on. Brown spots can be an indicator of leaf spot disease caused by a fungus. We live in northern NY growing zone 4. I have a large star jasmin, still flowering beautyful. Question , when I bring it in how far and how much can I prune it. It is big. Once it is done blooming you can safely prune your jasmine by 1/3 of total height. We live in northern Miss. Our jasmine is 5 yrs old and prolific. To the point, I am cutting back some areas of it about 12 inches each month- it is over 7 feet tall on trellis. Since it blooms from May to Sept. or later, when can I cut back 1/3 like you recommend? You can cut it back after bloom in the fall or winter when the plant stops growing. Prune away any dead, weak, or cold damaged shoots in late winter after danger of frost is over. When I bought my Jasmine, the label said Confederate Jasmine. Everything that I’ve been reading on Confederates, they have small star shaped blooms. Well, mine have a large pink flower. Beside that, I am now having a problem with yellowing leaves. The plant seems to grow new foliage as quickly as the leaves turn yellow and fall off. I live in S. Florida. My plant is potted, well drained, gets morning shade and full afternoon sun. I try not to over water and I’ve fertilized with a general fertilizer. I hope you can help me with my yellowing leaf problem. Yellow leaves can indicate several problems- either too wet or too dry soil or nutrient issues. Insects can also be the case. so check the plant closely. I live in central Florida and have confederate jasmine planted around the bottom of my magnolia trees. It has been growing for about 10 years, and has only flowered once. Can you tell me what could be the problem? It is otherwise very healthy and gets some sun during the daylight hours. Your confederate jasmine may not be getting enough sun to bloom. Do you fertilize it? I have a jasmine I bought last summer and put in a patio pt. It bloomed well last summer (in Seattle). It weathered in the winter outside under a protected area just fine. It has tons of new growth and buds about to open, but for the last month, it has dropped leaves, yellow to brown on the old wood. The new leaves are kind of mottled now and I was thinking they’re going to drop too. What to do? There are tons of buds. We had a very, very late summer. Just now getting into the low 70’s. I don’t see any kind of bug or rust or anything. Is it something in the soil? Help. Jasmine will shed some of their leaves after winter. Mine did the same thing and bloomed profusely until end of June. If you didn’t repot the plant in fresh soil, it may be lacking some nutrients. Give the plant some fertilizer for acid loving plants to help it along. Also, check the plant closely for insects such as scale (sticky stuff on leaves). Can I grow this jasmine in DC? I want a lot of smells in my yard and need suggestions of what type of plants will grow. Confederate Jasmine is hardy in zones 8-10. DC is in 6b-7a. Cultivar “Madison” is hardy up to zone 7. I was born & raised in Los Angeles. The Star Jasmine has always been my favorite plant of choice. Now I live in PA, zone 5/6 (depending whose chart I plug my zip code into. )I miss the fragrant easy to please star jasmine. Do you know of any plant with a similar fragrance that can hardy-out in zone 5-6? Vine or shrub is ok…but nothing that has to be brought indoors over the cold snow& icy PA winters. One shrub that comes to mind is a Viburnum shrub- Viburnum carlesii(Koreanspice viburnum) or V. judii have a sweet jasmine-like fragrance in spring (March-April). One of my favorites. Privet and Mock orange are also fragrant hardy shrubs. I live in North Carolina and we have 6 full Star jasmine plants in the lattice around our pool that have grown very thick over the last two years. Our pool deck has to be completely re-done due to damage and the fence has to come down. I hate the idea of losing the jasmine. It is June now (aka HOT) – is there a way to transplant them somewhere else? If yes, how – for best chance of survival? Please help! June is not the best time to transplant but if you must, try to dig up a good rootball. Before you dig, have the transplanting hole ready for a quick transfer. Cover with soil and water in well. Add a couple inches of mulch to maintain even moisture & temperature. In addition, trim at least 1/3 of the vine so that the root system has a chance to focus on growing new roots instead of feeding the leaves. Watering the plants with a roots starter will also help stimulate new root growth. I’m in southern fl. I just purchased two 1 gal containers of Star Jasmine and planted it in a large pot with a wire trellis… There are no blooms on it at present. Is it too late or can I expect blooms and fragrance this year.? Confederate jasmine blooms in spring/summer, so you should still get some flowers. The heavy bloom is in spring. We were thinking of getting a confederate jasmine for our yard here in the Norman, Oklahoma area. Is it a perennial? Are we in a good zone for maintaining this plant? Confederate jasmine is hardy in zone 8-10. Norman Ok is in zone 7a. “Madison” cultivar is reported to be hardy in zone 7. Plant it in a protected area. Ok I live in Southeastern Illinois zone 6 and I am wondering if I need to repot and bring Jasmine plant inside for the winter or can I winterize it and it still live . I love this plant and dont want to lose it !! Confederate jasmine is hardy in zone 8-10 and the “Madison” cultivar zone 7. You will still need to bring it indoors for the winter. I bring mine in every year and this year it is blooming better than ever. I live in Denver and would love to have some confederate jasmine – can it thrive here? And where can I buy it? They can live as a potted plant outdoors during the summer and would have to be brought inside for the winter. Check at the garden centers and major home centers(Lowe’s, Home Depot).